Hi I’m Jeffry Evans, a licensed real estate agent, investor, property manager and all around entrepreneur. On top of being a realtor, I’m also a webmaster and love creating websites and doing other technical things. Anyway, I noticed one thing when I was searching the web, and that was the need for a good website that taught new and veteran real estate agents alike, how to prosper in the real estate game. It was also important for me to make it a completely free resource center. So, that’s why I created this website for you. It’s to hand you my research so you don’t have to waste time scouring the web. And also to add the money making part that government real estate licensure training courses, tests and programs don’t cover. I invite you to take advantage of the information on this site and use it to make more money and improve your practice. If you’re brand new to real estate, the first thing you need to do is get licensed. I’ve put together all the information you need based on your specific states’ requirements. Simply select your state and enter your email address below and I’ll shoot you a quick email with all the info you need. 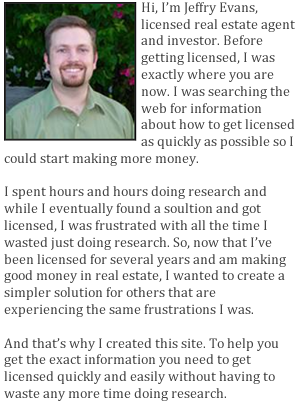 I’m committed to you becoming and successful real estate agent and I hope you enjoy the site.